Installation: normal download dmg & drag app to Applications folder. Easy. Corel’s AfterShot Pro 2—also available in a non-pro version for half price—is the only paid, cross platform (read: Linux-available) photo-editing/darkroom application I know of. If there’s another, clue me into it… I’d like to test it too. As a paid application, it’s a bit slicker than the open source applications I’ve looked at so far, more internally consistent, but it uses some of the same tools in the same ways. It’s pretty slick and pretty easy to use. The only default settings applied is something called ‘RAW Noise Smoothing’ at a default of 50. It’s easy to find the default settings: Preferences–>Default Settings contains 3 xmp files. One is DefaultRaw, and it contains all of the possible settings. I played around with it some, and it’s easy to deselect the active things, but I couldn’t select anything. It’s probably also easy to make the default whatever you want… and it is. Help articles are clear, easy to find, and concise (or seem to be, if the above is any indication… it took me about 25 seconds to find the answer). AfterShot includes Athentech’s Perfectly Clear plugin built-in, so it’s a one-click adjustment, with drop down options to add a tint at Min and Max levels. Here are a couple of images (from the Unnatural series) with the effects applied. I think Perfectly clear helped the first one some, but the second one came out a bit too bright for my taste. The tints in the first image are a bit garish, but I can see a use for them maybe; I have no idea what happened in the second one. All in all, I think Perfectly Clear is a great addition to AfterShot Pro, especially as a one click make-betterer type thing. Plugins are available for PhotoShop ($149), Lightroom ($149), or both ($199). I’m not too interested in it for that price, though the plugins probably do more than the automatic mode in AfterShot. But the auto mode is $79 (at most), and includes a full photo editing suite alongside. Like most Auto things, use at your own risk. At the top, you’ll find any panels you pinned. (To be honest, I only realized there was a pinned option when looking at this, though I did pin the Histogram early on.) You can pin most any of the individual panels, and panels organize themselves in the order you pin them. It would be nice if it allowed some drag/drop, but it doesn’t. Standard has the Histogram; a Basic Adjustments panel (AutoLevel & Perfectly Clear, White balance, Temp, Straighten, Exposure, Highlights, Fill Light, Blacks, Contrast, Saturation, Vibrance, Hue, Sharpening, Noise Reduction); a Keywords panel; and finally Presets. Plugins has the Black and White Plugin and the Color Equalizer. I could probably pin these in some order that made sense to me, and then only visit the other panels if I needed something I hadn’t pinned, but honestly I only noticed this at the very end of the review… Goes to show that, as I mentioned before, via Ms. Stone, you should really get to know an app before you review it. Looks like I’m breaking that rule already, as I suspected I would. Anyway, on with the general complaints. The cropping is strange. It crops, but it’s not nearly as precise as Lightroom and other cropping tools I’ve used. There’s a little red line that pops up to indicate which edge/corner you’re moving, and that’s sorta helpful. But then there’s a black line, and then a white line, and I can’t tell which one is the cropping boundary. To be honest, I much prefer Lightroom’s cropping. Zooming works only in steps: 18, 25, 35, 50, 71, 100, 141, 200, 283, 400, 566, 800. This is fine enough, I guess, but leave you with a bunch of blank space around the image, or some edges chopped off. Unlike LightZone, changes in the various adjustment sliders are reflected in the preview, but also in steps. This *might* have something to do with my 3 year old MacBook Pro, but I tried with the integrated and the discreet graphics, and with Cuda installed (it didn’t seem to do much and I recently uninstalled it in an attempt to fix some problems with Chrome… didn’t work). Anyway, the jumpy changes are a bit distracting. Spot removal is completely different to what’s found in Lightroom (and Aperture too… but it’s similar/identical to the Spot Healing in darktable, if I recall). You control the size of the spot and the size of the feather with the scroll wheel: scroll in the center of the spot to increase its size; scroll in the feather area to change the feather. Automatic Clone Spot picking is not very good, and after using Lightroom’s very simple and reasonably accurate spot healing brush for so long, the AfterShot Pro version is a bit difficult to use: it’s difficult for me to tell where the circle is going to land before you click it, and the pattern/tone/contrast matching or whatever the software uses to calculate a likely match is somewhat lacking. Converting negative is easy, and after doing this in Lightroom so many times, obvious: just invert the tone curve. It’s also easy to create a preset… so easy, in fact, that I did it when I first tested AfterShot about a week ago and promptly forgot how to do it. Right next to the Invert checkbox (at the bottom of the ‘Detail’ panel), there’s an easy, one-click mirror checkbox. This is very handy—handier than Lightroom’s right-click option/menu bar option—but do Mirror before you Crop, because it mirrors the original image, not the the crop, and so will cause the crop to reset. Easy, one-click mirror option! Yay! Batch presets work, but batch changes to exposure don’t seem to. I could probably copy settings or make a preset or something, but it would be easier to just select a whole roll of scans, batch-invert, then get the exposure close for the whole group. 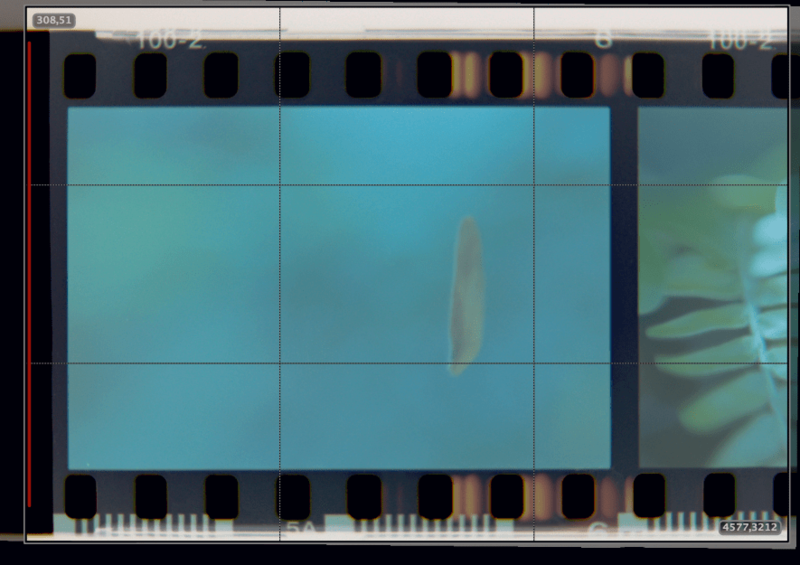 I continued playing with other negatives (as you can see from the various screenshots above and below), but then I noticed something: a good deal of noise and some banding that didn’t appear in Lightroom at all. So I went and made a comparison with Lightroom… exactly the same settings in each: Inverted, flipped, Exposure +2.40, Temperature 8570, Tint -37, and cropped (slightly differently). Another thing I noticed: Lightroom’s Exposure slider goes to +5/-5; AfterShot Pro goes only to +3/-3. This wouldn’t be a problem if I could figure out how to expose negatives properly… I had it down—within a stop or so—with the SB700, but due to battery door issues I recently acquired an SB-80dx, which is rather more powerful than the SB-700, so 1/8 power on the 80 is maybe 1/2 or something on the 700. Anyway: until I run some tests, I need all the exposure latitude I can get. Simpler RAW conversions showed no problems, and I got some nice results with ORF files (and NEFs too: see below). It’s sorta par for the course, though, maybe. If you have a decent exposure and a decent subject, a RAW converter can help it a bit; if you have a bad exposure and a decent subject, a RAW converter can help a make it a decent exposure; if you don’t point the camera at something worth shooting—and I’m as guilty of that as anyone, maybe even more so—no amount of software massage can ever do anything. But the ORF test is more to see if the software can read old files, and AfterShot did fine. If the software will read and process old ORF files from a 13 year old Olympus, it should do fine with a 4 year old Nikon. Back in the early days of my negative conversion attempts, I made this box thing that I intended to set on a table with a negative somehow mounted to one end and a flash popping into the other. I quickly figured out that this would be difficult with my initial prototype, since it was made of a crumpled pair of boxes, and difficult in practice, since I would need to get the camera level and plumb with the box, and any alignment I achieved would not be reproducible. Anyway, I used the crumpled box thing to make a snoot and shot a couple of selfies with it, hoping to get a new portrait for social media and whatnot. This is the best one of a mediocre lot, and it doesn’t rise quite match my one from 2012. Plus, it’s a bit too dark. And my hair’s a mess. Custom profiles are easy to load, and that might become important to me at some point, maybe… if I could get photos imported from my camera with accurate color, maybe it would take less time to massage pictures? But then, camera calibration could be a BIG project to get right… people recommend a separate calibration for every light source and lens, and that could be several hundred calibrations. I wonder if just one, under some neutral light source would be enough of an improvement to make it worth it… I have ArgyleCMS, after all, and a Color Checker Passport that I’ve kept in a black bag since I got it. Maybe I’ll give it a try… Anyway. 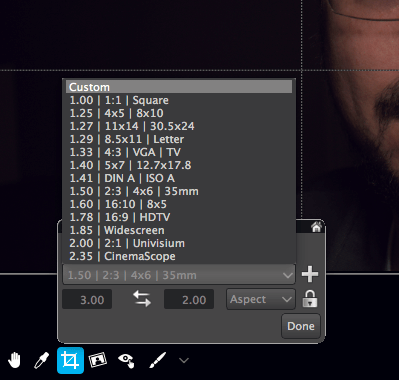 AfterShot Pro has easy custom calibration. 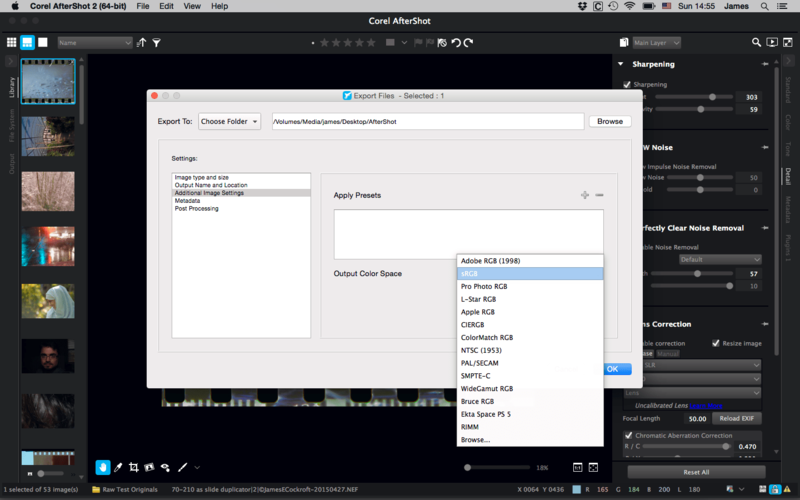 Similarly, it’s easy to embed a variety of preset or custom ICC profiles to images on export. GoGo. So that’s about it for the things I missed. I’m sure there are other things to test, like the much-discussed HDR option that I never found (but don’t care much about anyway), but I have other programs left to test. Ultimately, what do I think of AfterShot Pro? Well, it’s perfectly acceptable. It has limitations and it has good things about it. Truth be told, for $42.99 (at time of writing), I’m tempted to pick up a license and just hold it for a bit in case I end up moving to Linux. I won’t, but I’m tempted to. AfterShot Pro 2 might not be everything I’m looking for in a full-time RAW converter/Photo manager, but it has enough to satisfy most of the general requirements. And even the problems aren’t that bad: I could easily keep my digital assets organized with the Finder, and import/rename with Image Capture and some Automator actions; the exposure adjustment limitation of +/-3 stops should be more than enough to fix even sloppy exposures (and it is, most of the time); its tendency to crush the blacks is easily compensated for, and likely only arises from my relative unfamiliarity with AfterShot. I hope this helps someone, somewhere. It’s certainly helped me. And if you’ve read this far, thank you! If you have a moment, please take a moment to tell me what you think. Did this help you? Did I miss something important? Look forward to my next review in the coming days or maybe a week… it’ll either be Affinity Photo Beta or RawTherapee. I’m not sure yet. Actually, after about a half hour with Affinity Photo Beta, it’s not really eligible for these reviews, since it’s really more of a Photoshop competitor (at which it does a fine job) than a Lightroom clone, and I’m not much interested in a heavy-duty image processor at this point. Not to mention that the current version of Affinity Photo Beta is very Beta: after working on the droplet pic for over two hours and making notes on the app, screenshots, etc., it crashed when I went to save and exit. It did save a file, helpfully, but that file only contained the crop ratio, and not the actual crop, the straightening, the negative/positive conversion, or anything else, so it’s really not up to the game. So RawTherapee, here I come! *Truth be told, I played with this image in a bunch of applications before I started this public test, and the white balance differed wildly in each one. **Of course, a quick internet search led me to a way to change/set my own defaults, but that’s a subject for a different time, if at all. And it strikes me now that maybe I’m comparing apps to Lightroom too much. Maybe so, and given Adobe’s considerable popularity and funds, it’s probably unair. That said, I’ve been using Lightroom virtually exclusively for over 2 years now, and have no other frame of reference. Perhaps these reviews will give me such a frame.